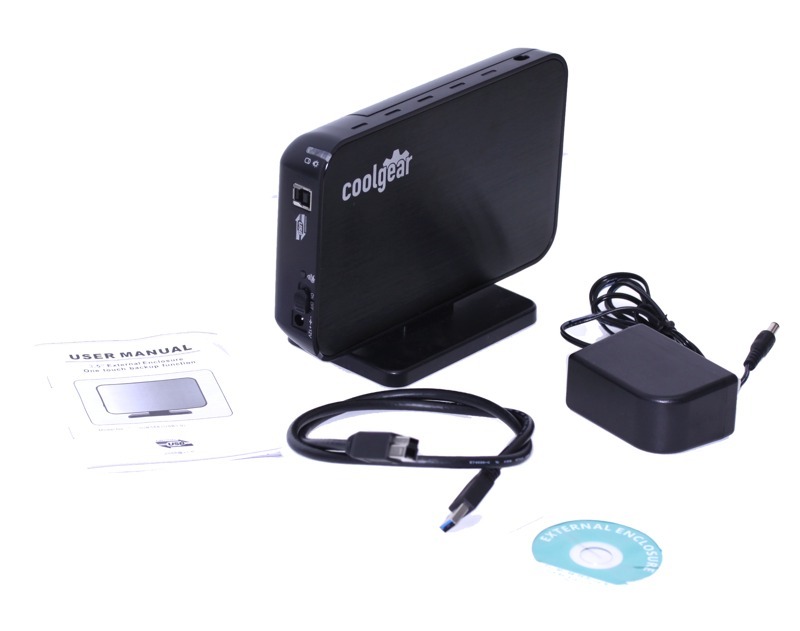 This brand new enclosure from CoolGear supports the latest USB 3.0 technology with transfer rates up 5Gbps!! * Tired of waiting around for large file transfers on your old USB 2.0 enclosure? Then upgrade to this blazing fast USB 3.0 enclosure today! Copy HD videos in minutes not hours and stream HD video live of the disk! Screwless design. Easy to install or remove disk Fits all 3.5" disks Compliant with USB 3.0 and SATA 3.0Gbps One Touch Backup Supports Plug-and-Play and Hot-Plug Self Regulating power - Spins disk down when not plugged in to preserve power and disk longevity. 1x 3.5" External USB 3.0 Enclosure 1x 12v AC adapter 1x Mini-CD Software 1x User Manual 1x USB 3.0 Cable *Maximum transfer speed limited to 3Gbps by SATA 3.0 drive.